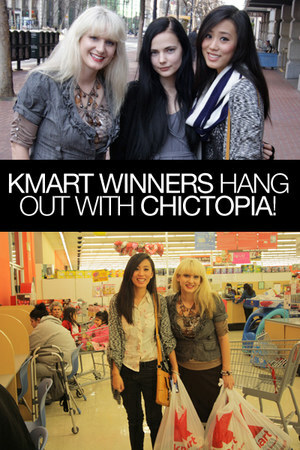 Kmart Winners Hang Out With Chictopia! Today we were super excited to meet our three lucky Chictopian winners barkatt, jamour, and lechateaudesfleurs of our Winter Wonderland contest! These lovely ladies (even lovelier in person!) flew into San Francisco last night to prepare for a fun day with the Chictopia and Kmart Apparel team! This morning we put away our laptops and had some coffee and croisants with the three winners in our Chictopia office! We got to take outfit photos outside on the busy Market Street of everybody! I got to try using jamour’s HUGE fancy camera (hope the photos came out decent!). Everyone then went to Kmart to do their $300 Kmart shopping spree! They definitely didn’t need any help styling—our winners know how to shop for goodies all on their own! Barkatt’s favorite Kmart items? Cute cardis, one of them a chic grey cardi, comfy and warm knit just like her style, from the maternity section of all places! Their styling and shopping skills made our jobs super easy! This contest’s prizes are pretty awesome—our three winners won a trip to San Francisco, a flip cam, a Kmart shopping trip, personal styling by the Kmart Apparel and Chictopia team, and a private breakfast, lunch at Fang’s and dinner at Amber! A FULL DAY with us! How lucky, eh? Their blogs will also be featured on Stylesip and they will get a chance to blog for Stylesip! Stylesip will also promote the winning blogs on Facebook, Twitter and Youtube. This contest prize was ah-mazing. Thanks for the wonderful day ladies! We hope you had fun with us today, and enjoy the rest of your trip in sunny San Fran! Like to see your girls have fun! congrats! aw big congrats to the winners! you ladies look so stylish and tres chic ;). good thing the weather was warm this weekend in SF! they got experience the lovely spring weather coming :). looks like so much fun! congrats! Looking forward to seeing what they bought! Blogger get togethers make me so happy! Can't wait to see what they picked. And congrats winners! Love Grace. I had a blast ! Thank you so much ! You are all so friendly and personal ! love SF ! It is always so awesome to see everybody just chilling and hanging out! Such stylilsh people! Faving this one :).